If you store your inventory and product samples at home in a dedicated location, you should be eligible to claim for business use of this space without needing to meet the usual "exclusive use" test. This means that even if you use the same room for other non-business activities, you can in most cases still claim this as part of your deduction (See the official IRS guidance here: Publication 587). Example: James stores his fabric and finished products before they are shipped out in a spare bedroom. This bedroom is also used on occasion as a guest room. As per the usual rules of "exclusive use", claiming this room would be disallowed due to mixed personal and business uses. However, as James is storing inventory in this location special rules apply and he should be able to claim this room as part of his deduction. Many home based businesses don't claim this deduction due to fears around being flagged for an IRS audit. In fact, this deduction is one of the easiest to be eligible for: as long as you follow the rules properly then there is no reason why this deduction shouldn't be confidently claimed each year. Make efforts to ensure the space is separately identifiable space suitable for storage. There are two main ways to claim this deduction: the actual expense method and the "simplified" expense method. The actual method involves figuring out exactly how much of your home running costs can be directly attributed to your business. Rent / mortgage interest, property taxes and renter's insurance are all costs that can be proportioned and claimed based on the percentage of space you are claiming you use for your business. Utilities like heating, internet and water can also be pro-rated in the same manner. If you're keen on looking into using this method, it's a really good idea to discuss this in detail with your accountant as you'll need to make sure you are calculating this correctly. The simplified method, as it implies, is a lot more straightforward. Essentially it means that you can claim $5 per square foot of your office space - up to a maximum of $1,500 (300 sq ft). To calculate, just measure out the square footage space for the space that you use and multiply by 5 to get your final deduction. Example: Irene uses a second bedroom as her inventory storage and workspace. She measures the size of the room as 150 square feet. To find her deduction, she multiplies 150 by 5 to arrive at $750. A handy tip: it's a wise idea to measure carefully and take photos that clearly show your use of the space: as is always the case with the IRS, the more evidence you can produce to back up your claims the better. This deduction once calculated should be claimed on IRS Form 8829:Expenses for Business Use of Your Home. 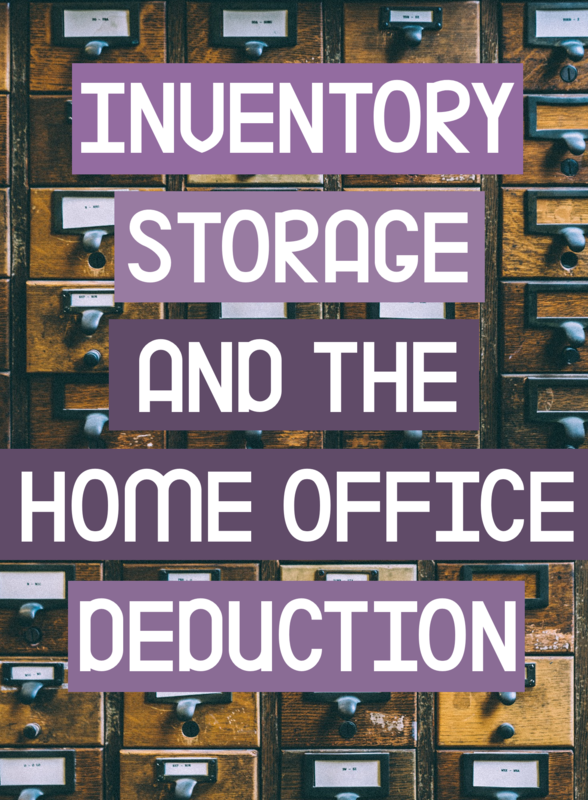 As most crafters have significant inventory and already have clearly allocated storage areas then these rules tend to be applicable without needing to make any special efforts - so if you aren't claiming this deduction yet then you should be! However, if you are currently operating out of a variety of rooms of your house with your materials in a multitude of places, you now know it's worth getting organised and setting out a dedicated space for your business so you don't miss out on any tax deductions in the future!